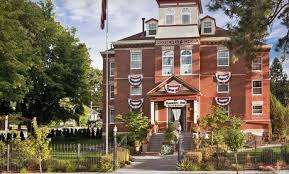 In this Hotel Hell episode, Gordon Ramsay visits the Roosevelt Inn in Coeur d'Alene, Idaho, located in an old school building, run by John Hough, Tina and her daughter Lorien do everything whilst John is only there once a month to run a murder mystery evening. Gordon is not impressed with the exterior and inside he is met by an unpleasant smell. Gordon is taken up to his room, it is very pink and costs $319 a night. Gordon speaks to John about his apparent casual attitude and John tells him he occasionally gets violent with guests if they upset him. After the inspection, Gordon sits down with the couple to get to the heart of problems in the business. John tells Gordon that they spent $700,000 to buy the Inn and now owe $1.7 million and they have had to sell their house, cash in a 401k and live in the attic at the Inn. That evening, Gordon attends the murder mystery evening and John is out front dressed as Sherlock Holmes whereas Tina is working in the kitchen but for all that work John has only made $200. After the evening, Gordon speaks to John and tells him he is more interested in putting on a show than being an innkeeper but John walks away. The next day, Gordon witnesses John cooking a five course lunch menu, the shrimp cocktail and salmon is frozen. Gordon reveals that he had slept on the couch as he couldn't sleep on the bed and invites John and Tina up to his room. In his room are guests who have stayed in the hotel over the last few months, they complain that the Inn is out of date, the food quality was low but the price was high and that none would stay again. A black light to the bedding reveals the extent of the poor standards. The next day, Gordon and Tina meet to discuss the ballroom before he meets a wedding planner, who has struggled to promote the space to potential bride and grooms. When he returns he sits down with the couple and John finally admits he needs to change. Gordon begins working on improving the Inn with an all new menu featuring home cooked meals and also renovates the ballroom, with an amazing makeover. Gordon reveals to the pair that he has booked a wedding into their new ballroom that evening for their relaunch! The event is a hit and goes smoothly. Yelp reviews and Trip Advisor reviews are mostly excellent since Gordon revamped the hotel. They have reported that business is better and that Gordon's changes have made breakfast easier and better for the guests and they have also named a suite after Gordon. Planning a visit to the hotel? Check out their website for further information. Roosevelt Inn aired on September 03 2012, the episode was filmed in February 2012 and is Hotel Hell season 1 episode 6. To be honest I was really hoping that Tina left him. John is a despicable excuse for a human being and I wanted to punch him in the face watching this episode. Talk about being a manchild! Here's hoping he finally grew up and learned how to behave like an adult, for his wife's sake if nothing else. Yeah it's called editing. They purposely depict people to look a certain way so they can tell a story in 43 minutes. I would love to be there for the entire filming of an episode. I agree Ami...I watched the first 10 minutes and was wondering why he is wife hadn't kicked him to the kerb. She deserves a sainthood. Marriage is for better or worse, both of you don't seem to get that. That's 20th century thinking. Life's too short for such an attitude. For better or worse only counts when both people are trying. It obviously doesn't have to be 50/50 all the time, but 13 years of her giving all and him taking even more, that's not a relationship. He'll drive her to an early grave at this rate. He doesn't care about her well being. If you want to talk old school values, he's failing in every way that a husband can fail. It's not the money, it's every way that he tells her that she doesn't matter all the time. You want them to divorce and bring more demonic spirits into the situation?! I don't think that he didn't care. Running a business with that much money in debt is extremely stressful, it can change someone. In the end, seeing how they're still open, I guess he finally changed his ways. Judging from the reviews and their website, they look very successful now. Eventhough I initially hated John in Hotel Hell, since they are still together running the b&b, I guess they also manage to repair their marriage. Part of me think it's because they don't have the financial stress and John finally living outside of his fantasy world and take some responsibilities. I'm really happy that this worked out for them. Tina is an amazing human being for putting her dreams aside for her husband, and he should have woken up long ago, he's a lucky man for having her. Good thing they had the cohones to call Gordon's show.